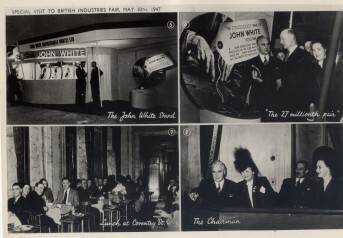 John White’s exhibition at the British Industries Fair in 1947 the year they made the 27,000,000th pair of shoes. Rushden is a town built on shoes and shoemaking. Rushden in 1849 had six shoe makers and associated businesses, yet 40 years later, this had increased to 61. These businesses drove a growth in employment and house building turning what was once an agricultural village of 320 houses in 1850 into a flourishing industrial town by the end of the nineteenth century. This trade made Rushden firms some of the biggest shoe manufacturers in the UK. 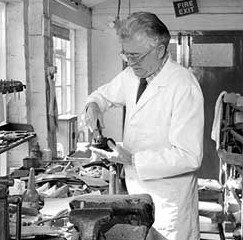 John White Footwear Ltd. alone made 8 million pairs of army boots during WW2. 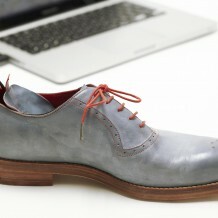 This continued into peacetime with Rushden firms opening up foreign markets for Northamptonshire footwear. By 1951 John White was sending 400,000 pairs of shoes a year to America, which was 90 per cent of the shoes exported from this Country. In the 1960s, foreign imports started to arrive, and decline set in across Northamptonshire, and in many small towns the shoe trade was all but gone by the mid-1980s. 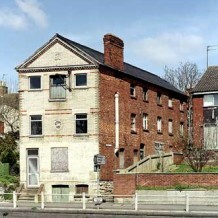 Rushden held out longer than most, though by 1983 the number of sites in operation was down to about what it had been a hundred years earlier. The industry thrived and by the 1930s there were over 40 factories in Rushden. By the mid-1900s, foreign imports started to arrive, and the local industry declined. Some of the large factories closed, one by one, with many of them converted to new uses so that the town’s history can still be seen.